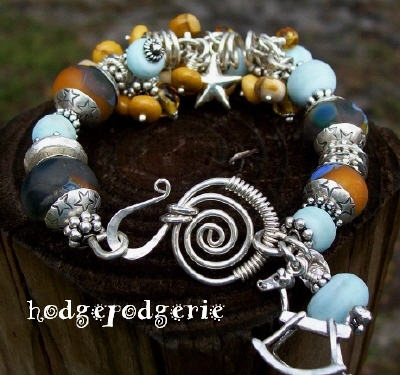 I had great fun creating this Southwestern-themed Sterling Silver bracelet! 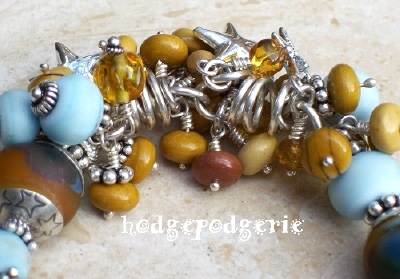 The inspiration for its theme came from Cindy Hoover's gorgeous lampwork beads. 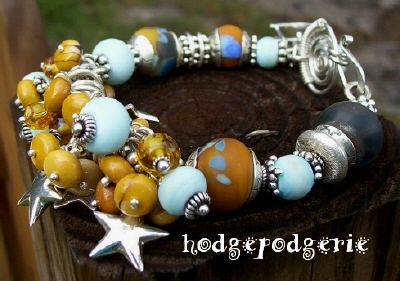 With one-of-a-kind star-stamped Sterling silver bead caps, the design brings to mind fun childhood memories of playing Cowboys and Indians! You'll have as much fun wearing it as I had making it! 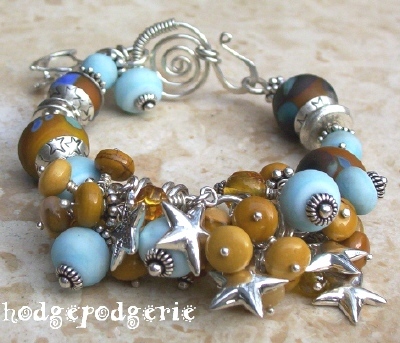 I've added a cluster of mookite jasper rondells in colors matching those in the lampwork, Sterling silver stars, vintage amber glass beads, a charming Sterling silver rocking horse and more of Cindy's wonderful lampwork. The charms give a pleasant muted jingle with the movements of your wrist. The bracelet is finished with a handmade hammered wiredoodle Sterling silver clasp, further enhancing its unique handcrafted look. It's signed with my signature 'S'. 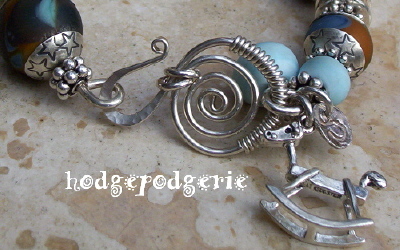 Return from "Happy Trails Bracelet" page to "Bracelet Gallery" page.